If you're not already pissed off by the astronomical price increase of a decades-old lifesaving medicine, well, you really should be. The drug, known as Daraprim, has long been used as the standard treatment for a life-threatening parasitic infection called toxoplasmosis, especially among HIV and cancer patients. After acquiring the drug last month, Turing Pharmaceuticals raised the price from $13.50 per tablet to $750, angering doctors, infectious disease experts, and patients who fear they won't be able to afford the medication when they need it. Even Democratic presidential hopeful Hillary Clinton slammed the decision. "The reason is nothing more than this guy saw a hole in the market he could exploit... it’s just garbage and he knows it." 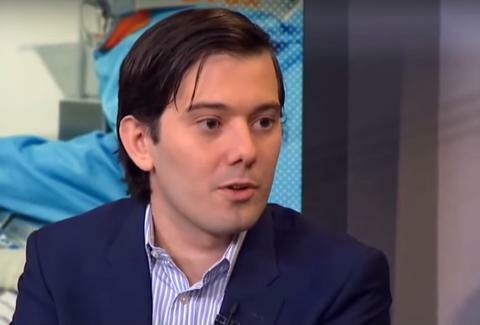 Despite the intense criticism, Martin Shkreli, a former hedge fund manager and CEO of the pharmaceutical startup, has remained defiant -- even calling a reporter a "moron" after he asked Shkreli to explain the increase, which probably didn't help the situation. Shkreli responded to criticism on Twitter by posting Eminem’s “The Way I Am," like a kind-hearted CEO, and in an interview with CBS News on Tuesday, he defended the move as merely a good business decision that will result in a "reasonable profit." For perspective, the average cost of treatment with Daraprim went from $1,130 to $63,000 and even eclipsing $600,000 for some patients, according to the report. Shkreli, 32, went so far as to say that while the increase may seen "greedy," it's actually "altruistic" because the profits can be spent on researching and developing a new drug, according to the report. But some have questioned whether drug companies should dump the high costs of R&D on patients who just need their critical medications, and whether there's an actual need to replace Daraprim with a new drug at all. "The excuse that the drug companies have always used -- and sometimes it is legitimate -- is that they have to fund research," said Ezekiel Emanuel, a bioethicist and Chair of the Department of Medical Ethics and Health Policy at the University of Pennsylvania. "It's a question of connecting the amount of research and the pricing, but there's no evidence that is the case here." As for Shkreli's claim that the profits will fund future research and development for a new drug, Emanuel doesn't buy it. "The reason is nothing more than this guy saw a hole in the market he could exploit," he said. "He’s a hedge fund guy, he's not a researcher. We don’t need another drug in this space, so it’s just garbage and he knows it." Cases where companies buy up generic drugs and jack up the prices with no additional research, though, are increasingly common, he added. While Emanuel notes that Daraprim is used by only about 10,000 to 12,000 people per year, that doesn't make the price hike any less egregious. "In this particular case, people will adapt and hospitals will adapt," Emanuel said. "But there is a limit that the system can take in terms of drug pricing." Tony Merevick is Cities News Editor at Thrillist and usually puts a joke here, but doesn't think that's appropriate for this story. Send news tips to news@thrillist.com and follow him on Twitter @tonymerevick.